And no one does this better than Ted Bell, author of Nick of Time, and now its sequel The Time Pirate. Set in the early days of World War 2, Nick and his family reside on a strategically important island in the English Channel, which soon finds itself overrun by Nazi invaders. Nick, who was already established in the first novel to be a boy of admirable patriotism, daring, and creativity, does his best to defend his homeland, even going so far as to restore (and fly) his father’s WWI airplane and engaging in home-made bomb runs over a Nazi base-camp. But flying vintage airplanes is the least of Nick’s anachronistic adventures – for he is of course the owner of one of only two Tempus Machina, with the other possessed by the infamous pirate Captain Billy Blood. And Blood, of course, can’t rest until he’s the sole possessor of this time-travel technology, at which point he would truly be unstoppable. Which leads Blood to kidnap Nick’s younger sister and transport her back to 1781 Jamaica in the hopes of forcing an exchange. The tale leads from one point in time to the next, with WWII England, pirate-era Jamaica, and Revolutionary War America each taking their turn at front-and-center. The story is gripping and fun. But for me, despite the fun of such a wide-ranging adventure, it’s not the story that makes this series truly stand apart. The Time Pirate, like its predecessor, is a young adult adventure. Nick is a clever and admirable boy, and his sister Kate displays equally, if different, admirable traits. But there are limits to what they can accomplish at such a young age – or there would be, if it weren’t for Nick’s additional qualities of loyalty, honor, and duty. Many young adult books seek to identify with their readers by addressing such concepts as broken families, rebellion, insecurity, and so on. But rarely does a modern novel so clearly paint boyhood as the road to manhood, with all the challenges that entails. The obstacles and dilemmas Nick faces may not be those of the average boy, but they are gripping and thought provoking: How can a young boy who loves his home play a part in fending off an invasion? How can one balance their duties to their family with their duties to their country? Or most intriguing of all, can it be honorable to betray your own country in the past, with the knowledge it may save your country in the future? No, these aren’t questions that today’s youth commonly face, but they are fascinating nonetheless, and Nick’s efforts to wrestle with them can be nothing short of inspiring. While Nick and his time-travel adventures are pure fiction, the history he explores is very real. From General Washington to Winston Churchill, this book is full of historical figures and the challenges they faced, and it does a remarkable job of bringing history to life. But while such prominent historical men are given a heroic treatment, it’s even more admirable to note this book’s treatment of other, less prominent adults. Nick’s parents and friends of the family, for example, are treated with depth and respect, thus humanizing them rather than simply treating them as a backdrop for Nick’s adventures. Far from being a childish madcap adventure, Nick is doing his best to survive in an adult’s world, full of grown-up heroes, villains, and those just trying their best to get themselves and their families from one day to the next in the most difficult of days. I’ve read many entertaining pirate books intended for young adults – indeed, many of them are amongst my favorites, regardless of age. But rarely is a book such an enjoyable read while also imparting the sort of life-lessons found in the Nick McIver Time Adventures. Heartily recommended! 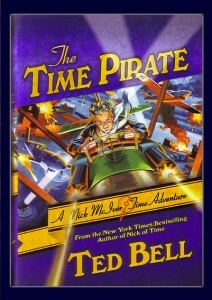 This entry was posted in Books and tagged nick of time, ted bell, young adult by Bilgemunky. Bookmark the permalink.